The complete embroidery machine. 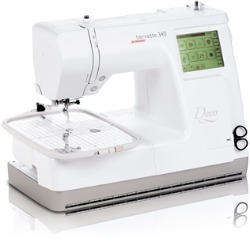 The 340 Deco will enrich your world with the wonders of embroidery. A hundred carefully selected embroidery designs are built in to get you off to a flying start. And you can choose from a virtually unlimited range of additional designs with the help of an USB port.